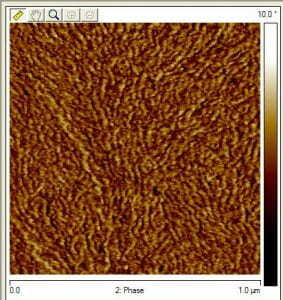 The Veeco AFM contacts the surfaces of samples using small probes ~10 nanometers across. 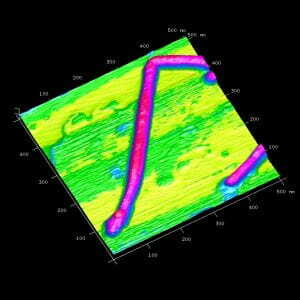 Precise tracking of the probe’s position allows the system to measure sub-nanometer displacements of the probe tip. By using special probes and/or optional sensors, it is possible to measure electrical, mechanical, magnetic or chemical properties of a sample at the same time and spatial resolution as the length data. To reserve time or request training on this tool, click here or on the image at left to go to the AFM tool page on SUMS. 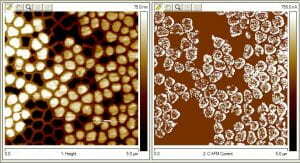 AFM is one of the most straightforward but information-rich analysis techniques available. 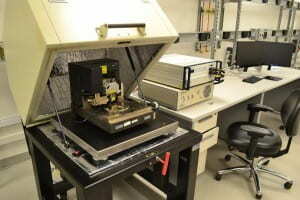 Practically any type of material can be analyzed in air, in liquid, or – using a built-in gas purge – in a controlled ambient . Built-in and plug-in sensors allow for multiple additional measurement modes.